At first glance, it seems that the information about the suspicion of US President Donald Trump about the loyalty of his “backup” Vice President Mike Pence appeared at the end of last week — the most common fake news that the New York Times loves to spread about the current White House owner. Such rumors have been before. The newspaper, which organized the Watergate scandal at the time, reported that in recent weeks, Trump has been trying to find out from his assistants whether Pence is loyal to him. Trump's entourage, according to the New York Times, assured the president that he considered Pence to be a “dedicated fighter”. At the same time, presidential advisers outside the White House are not completely sure of this and believe that Pence has already “exhausted its usefulness”. Both Trump and Pence quickly refuted an attempt by an influential newspaper to knock their heads together and sow suspicion towards each other. In an interview with NBC on the margins of the Asia-Pacific Economic Cooperation (APEC) forum, Pence stated that he and Trump “laughed” at the publication in the New York Times. These statements were preceded by a desire expressed by the first and second US officials to seek re-election in the same capacity in the 2020 presidential election. Meanwhile, the publication in the New York Times is not the first, which says that there is a lack of trust between Trump and Pence. Earlier it was reported that Trump, outraged by the constant “leaks” of confidential information from the White House, on the basis of which literary slaves hired by Democrats scribbled books with such details that outsiders cannot know. And Pence, denying his involvement in the intrigues against Trump, supposedly even proposed to test himself with a polygraph. Trump himself, who does not suffer from low self-esteem, is convinced that he is doing an excellent job with his work. However, Trump's numerous critics think completely differently, and for them, the idea that the current owner of the White House will stay there for another term is a terrible nightmare. The American globalist establishment and its numerous allies in other countries of the world, for example, in Europe, are looking forward to, when, finally, another president will appear in the USA. And they will do everything to ensure that a new owner appears in the White House as soon as possible. At the same time, everyone understands, including President Trump, that Vice President Pence has the greatest chance of “replacing” him. According to the US Constitution, the post of vice-president is the second in importance in the system of executive power. The main constitutional function of a vice president is to be ready to replace the president after his death, resignation or removal from office. The vice president of the United States heads the Senate and votes if the number of votes between the two main parties is evenly distributed, which Pens has already done several times. There are no constitutional restrictions on how many times a person can be elected vice president. The status of vice-president is even in some sense higher than that of the first person, as he takes the oath a few minutes before the president, and in case of death, resignation or impeachment of the head of state, he becomes not an acting president, but a full-fledged president. Temporary acting president, this figure can only be in the case of temporary incapacity of the president. Therefore, it is not surprising that vice-presidents often have presidential ambitions, and this position sometimes becomes the last step to the highest state post, as was the case, for example, for Richard Nixon and George HW Bush. However, to do this, it is necessary to participate in the elections and run for the presidency, which Pence does not want to do. However, he may well become president without this gimp. To do this, there is only one condition: it is necessary that something happened to Trump. Vice President Harry Truman became President in 1945 after Franklin Roosevelt unexpectedly died. There are very serious suspicions about the fact that the president was poisoned. Vice President Lyndon Johnson occupied the Oval Office at the White House after President John F. Kennedy, who had been quarreled with the CIA and a significant part of the establishment, was shot dead in 1963 in Dallas. Even if the ruling class of the United States goes without bullets and poison and makes the president go under threat of impeachment, as happened with Nixon in 1974, it’s still the vice-president who takes his place. Nixon was replaced by Gerald Ford, who had no presidential ambitions, who is considered the weakest owner of the White House in the United States. But in this case too, the establishment achieved its goal - it completely controlled presidential power. Why is Pence more preferred then Trump? Actually, the global establishment has only one claim to Pens - he is too old-fashioned in the era of “modern values”. But he is a good conservative in an American way. Pence never was friends with Steve Bannon, hates Russia, is convinced of the divine right of the United States to rule the world, and loves Israel. He is also careful and always makes the "right" statements. Despite his conservatism and reputation as an honest person, Pence, a lawyer by training, former congressman and governor, is flexible. Born a Catholic, became a Protestant. He was a member of the Armenian lobby in the Congress, but since 2007, having received a lucrative contract from a Turkish-related company, he began to vote against anti-Turkish resolutions, earning $ 15 million, as they say, in 15 years of lobbying. Pence positively differs from Trump, in terms of his opponents, in predictability. You can say even more. He appeals to many Republicans more than Trump for this reason too. Therefore, the desire to change the current owner of the White House, even if it retains its economic policy in basic terms, can also be part of the strategy of the leadership of the Republicans. 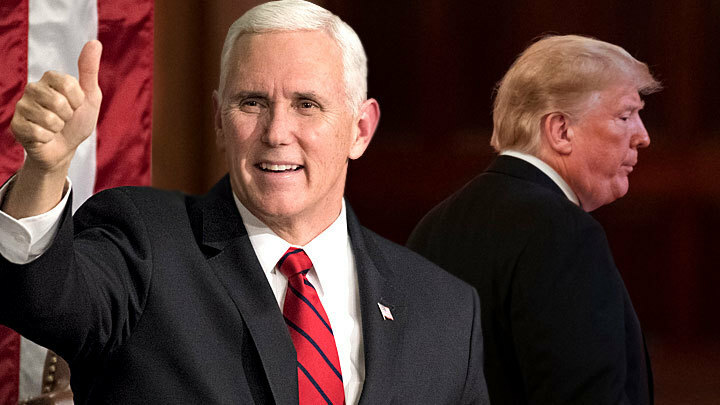 Pence at the head of the Republicans - without the train of numerous scandals following him - would probably have better chances of winning the next election than the current owner of the White House. Therefore, Trump, fearing a conspiracy in his entourage is quite understandable. He has a good reason to worry about Pence.